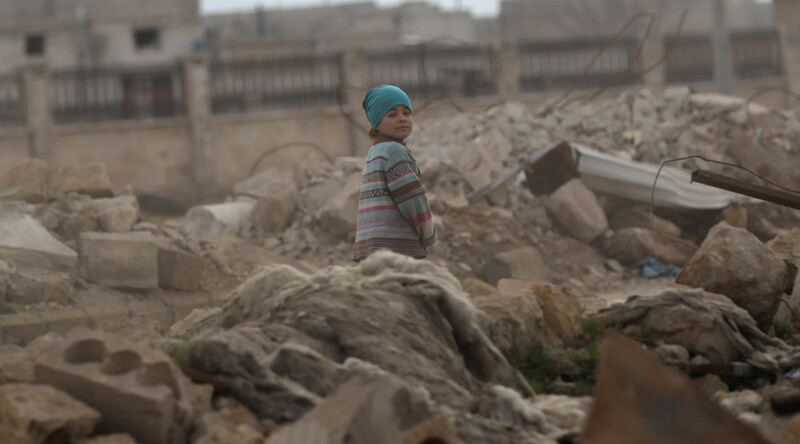 In December 2016, filmmakers in Egypt were arrested in the process of staging an Aleppo video with two children: the girl was meant to look injured, and the boy was to vilify both Russia and Syria. The incidences of fakery and hoaxes, however, does not end there. Also in December, the scene of a 'Girl running to survive after her family had been killed' was said to be in Aleppo. In reality, it was a scene from a Lebanese music video, which someone at some point clearly chose to depict as in Aleppo, for the same anti-Russian, anti-Assad vilification purposes. 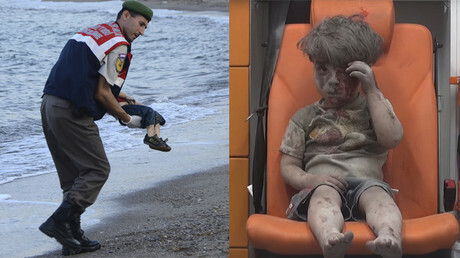 In November 2014, a clip dubbed 'Syrian hero boy' went viral, viewed over 5 million times already by mid-November. The clip showed what appeared to be a little boy saving his sister from sniper gunfire, and was assumed to have been in Syria. Once again, the so-called 'experts' got it wrong. The barrel which Galal referred to had a poor imitation of the flag of Syria painted on it, the flag's color sequence out of order. The clip she was so certain had been filmed in government areas of Syria was actually produced in Malta by Norwegian filmmakers. In the propaganda war on Syria, there are convincing lies, and then there are the blindingly clear hoaxes. In the latter realm, the Bana al-Abed Twitter persona takes first prize. The child is being abused by her own family who have seemingly forced her to pretend she can speak English (she cannot). We were meant to believe that sophisticated and nuanced tweets, often calling for Western intervention, are coming from an English-illiterate seven-year-old girl or her mother — whose husband was a militant in Aleppo. Bana not only tweeted with impossible frequency from eastern Aleppo, defying any internet lapses those of us who have gone to Aleppo have experienced. Whatever the actual explanation for her alleged preciousness and high-tech abilities, the child was clearly exploited, and continues to be. 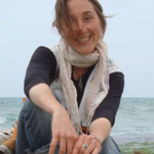 Her twitter account continues its advocacy for Western intervention in Syria. Not at all suspicious. Effective war propaganda tugs at the heart strings, using many tactics, including adorable children in threatening situations, or dead, and comes hand in hand with condemnations for crimes committed, allegedly, by the villain(s) being caricatured. In the following instances, children being injured or murdered did occur, but the condemnations were muted or not at all. A few weeks prior to the photo of Omran Daqneesh going viral as the poster child for suffering in Syria, terrorists of the Nour al-Din al-Zenki faction beheaded a boy said to be around 12 years old. Although the decapitators filmed the entire savage act, posing for gleeful selfies as they tortured the boy prior to murdering him, leaders and media in the US took little notice of the horrific slaughter. Ten days after the questionable events which led to the light injury of Omran, two young boys in the Idlib villages of Foua and Kafraya were shot in their head and neck respectively by a sniper from Jaysh al-Fateh terrorists in the village of Binnish close by. The injuries were serious. They were rendered even more serious given that the villages had been completely surrounded and fully under siege by terrorists since March 2015. In April 2017, a convoy of children, women, elderly and ill being evacuated from Foua were attacked by a terrorist explosion, with reports over 200 murdered, including 116 children. The attack included luring with potato chips and filming children in the convoy before later blowing them up and claiming to be rescuing them. Not only did these terrorists murder civilians and children, but they staged the scene to then look like heroes. Indeed, in the West this massacre was called a “hiccup” and little denunciation was made about the vast numbers of dead, let alone the injured. In October, 2016, Press TV was one of the few outlets to report on another adorable Aleppo boy, Mahmoud, “a six-year-old Syrian boy who was born without arms, and recently lost both of his legs after stepping on a mine planted by militants in Syria’s Aleppo.” The report includes scenes of Mahmoud showing his resilience, adjusting to life without any limbs. But for corporate media, Mahmoud's were the wrong villains. Terrorist bombings and snipings have killed children in schools and homes throughout Syria over the years, including the October 2014 terrorist car and suicide bombing of the Akrama Al-Makhzoumi School in Homs, killing at least 41 children by conservative estimates, or up to 48 children by other reports, along with women and other civilians, as well as attacks on Aleppo schools, as I detailed earlier. In Aleppo and in Damascus, I have visited numerous hospitals and seen endless poster children of suffering in Syria. The differences between these children and those which Western and Gulf media present us, is that these children were murdered, rendered critically-injured, or maimed by the bombs, mortars and snipings of terrorists which the West presents as “moderate rebels”, so their stories will never be front page, much less heard. The Western and Gulf media work in lockstep with the narratives emanating from Washington on Syria. It is not coincidental that certain photos and stories of Syrian children go viral, while other more damning photos and sordid realities get no notice period. Regarding the Omran case, we now know that he was not gravely hurt as media tried to imply, that his family have gone back to their lives in Aleppo, and the exploitation and lies around Omran cannot continue. When I met them on June 6th, they showed no signs of the duress which terrorists and their backers—which include Western corporate media—claim. Instead, some neighbors were over, discussing media fabrications around Omran. However, the children who are believed to have been exploited and used in the 2013 Ghouta chemical weapons fabrications remain missing and have not gone back to their lives, nor have their families in the Latakia countryside. While in al-Waer, Homs, on June 9, 2017, speaking with a woman who had returned not long after the last terrorist had been bused out in the government's reconciliation agreement, she told me a story of her friend from the area. Bearing in mind that this is second hand information (and that I didn't have time to stay another day to meet the friend in question), I'll leave her words and this 2012 link as food for thought regarding the use of children, alive or day, for war propaganda against Syria: “In 2014, my friend's son, Louay was leaving his school. A mortar fell on the street nearby and he was hit with shrapnel. The Red Crescent took him in an ambulance to al-Bour, a nearby aid association, which couldn't treat him, so he was taken to a government hospital in al-Zahra'a. They tried to save him, but he died. They took him back to al-Bour where they cleaned him for burial. While my friend was waiting, people from al-Bour carried him onto the street yelling the regime killed him, look what the regime does to children.'" Later, she saw on both al-Jazeera and al-Arabiya footage of her son, with men blaming the "regime" for killing children in Syria. But she didn't agree. The government helped her son and tried to save his life. He was 7 years old.